In the future there will be no waste, they say! Really? With the buy-use-waste system that we are in, with the cheap products, consumerist general effort and capitalist system around it, with the relentless need of growth? Well, I am curions to see how our three speakers this afternoon envision this no-waste-anymore (the latter might be the hardest part) world. In a country where 30% of waste is coming from the construction field, the challenge for architects is obvious. Dirk Hebel starts with questioning our construction habits. It has been a century now that it was decided that reinforced concrete and steel are the best building materials. If we keep relying on these only, sandwars are expected to be violent! Alternate materials, such as bamboo used instead of steel, are to be implemented. 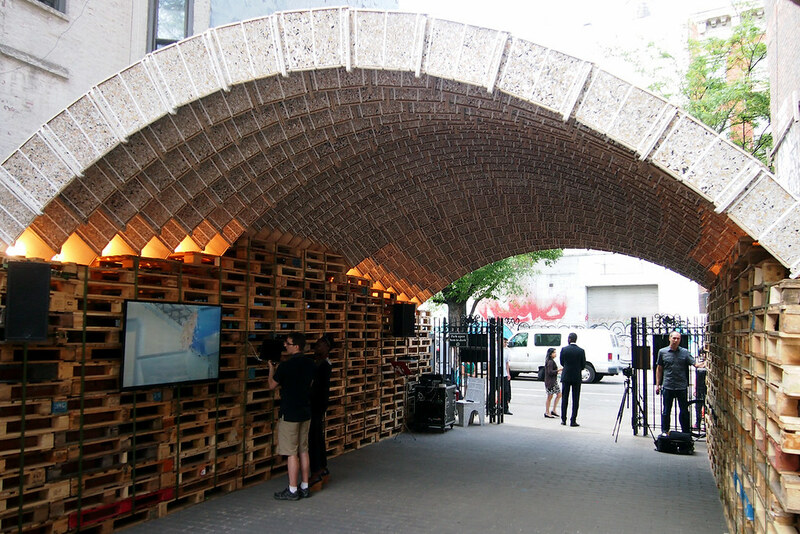 The very pavilion we are piled in today is made from recycled materials: boards made of paper waste fit together to form blocks. Finally, the speaker leaves the conclusion to Mitchell Joachim: “the city of the future does not distinguish anymore between waste and supply”. The Q&A part, which often happens to be useless, is very interesting this time, with ideas worth sharing and remembering. The building is never to consider by itself but on the contrary as part of a large and complex system. The building industry is far from a small business and architects need to keep the big picture in mind. The definition of waste is then put in perspective. Waste is both product and ressource, and is not just material: waste of time, of culture, of energy, etc. After the Recycling era started in the 1980s, with material getting back to what it was, we are now going further, adding a new value, transforming, adding skills on top of a given material. And “the architect is seating on the driver seat of this car”, “cultivating material for future building”. “Buildings are waste in transit”. In developing countries, constraints emphasize common sense and people build beautiful out of nothing. If most of future cities are southern, the role of Western culture is to give value to waste, to change conception of materials. Mud is a good example of this renewed interpretation. The real question, about cost, time and reliability is enthusiastically torn down by David Benjamin arguing that with a bit more thinking at the design phase (we call it “grey material” in French), it is possible to be actually cheaper, to specify a realistic span of life for the building and to study innovative materials and structure to install a new norm. Thanks for your comment! I corrected Mitch’s name.